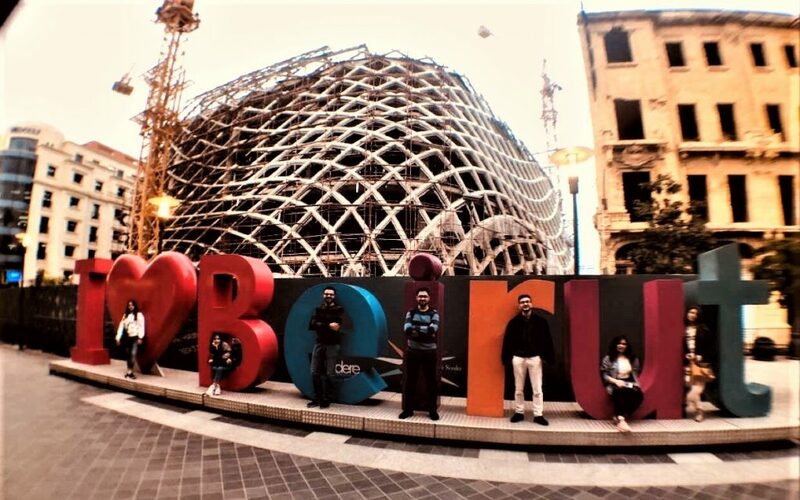 Duhok, Kurdistan Region of Iraq – November 19th, 2018 – Students of the American University of Kurdistan visited both cities of Erbil and Beirut for Architectural/ Cultural field research and exposure for five days from November 13th to November 17th, 2018. Four students from Architectural Design and Building Technology: Materials and Methods (combined) and thirteen students from Architecture: Culture & Community joined the trip under the supervision of Prof. Marga Jann, Chair of Architectural Engineering, and Kawar Tahseen Salih, Lecturer in the Architectural Engineering department. “The field trip was a wonderfully enlightening, fun experience for all, jam-packed with activities and sights and a good exercise (as well as “good exercise”!) in “experiential education”. It is hoped that this trip will set a precedent at AUK for many more.” Said Prof. Marga Jann in a statement. On the first day of the trip, students visited Erbil, the capital of Kurdistan Region of Iraq. The key focus was the Citadel for which the tour was guided through the archaeological dig, historic homes and civic buildings undergoing restoration, the Music and Textile Museums, beautifully renovated vernacular structures, the old Hammam, and some of the village streets as well as the Bazaar. “This trip was an astonishing experience to realize that the history of architecture is essential and can’t be ignored.” Said Lana Mustafa, one of the students. After a two-hour direct flight from Erbil, AUK’s future engineers arrived Beirut, the Capital of Lebanon, nicknamed “the Paris of the Middle East” for its French influence and vibrant cultural and intellectual life. The students settled in Hamra, near the American University of Beirut (AUB) and the Corniche (Mediterranean sea-side boardwalk). AUK students were guided through a tour in the American University of Beirut (AUB). This tour was set up by AUK student Zeen Moneb and given by AUB third-year architecture student Mira El Hajj, who had AUK students visit her architecture studio where they were able to talk to AUB students and see work in progress. A highlight of the tour was Zaha Hadid’s Issam Fares Institute for Public Policy and International Affairs. “What was very special was the building designed by Zaha Hadid, as well as walking through the tree museum (AUB botanical gardens).” Said Anaas Kifah, one of the students. The AUB tour was followed by a visit to the National Museum, a moderate-sized, exquisitely restored classic, regional museum, and with a walk across the street, students visited the stunningly designed underground Mim Museum of rocks and minerals which included holograms and elegantly lit vaulted display rooms. After touring the plaza of the Université Saint-Joseph, next stop was Beirut North Souks Department Store, designed by Zaha Hadid, where we all crossed paths as dusk arrived. On the last day of the trip, students had free time to explore the city further—some went to the Raouché on the western Corniche, some went shopping, some went on a tour to Byblos and the wax museum. “Lebanon is a great place with awesome architecture, fascinating views and good hearted people.” Said Ari Hameed, one of the students. Kawar Tahseen Salih, Lecturer in the Architectural Engineering department underlined the importance of such field trips for students to help them discover new cultures “I have been working as a university academic for five years, and teach in four different universities of Kurdistan; yet, having a trip like this is the first of kind we had. Based on my experience, our students are highly in need for such type of field trips. It helps them discover new cultures, architecture and live a different experience than the classrooms apart with fun that we all had during the trip.” He stated. This invaluable experience provided by AUK intended to enhance the students’ learning experience “It was overall a very good learning experience that connected us to the real world and developed a good sense of leadership in all of us.” Said Natalie Zaya, student of AUK’s architectural engineering department. AUK’s department of Architectural Engineering curriculum provides an integrated educational solid mathematics, basic sciences, soft skill general education, engineering sciences, and architectural engineering design courses. A degree in architectural engineering will prepare students for careers as professional architects, design experts, and other careers requiring advanced knowledge of architectural and structural engineering.